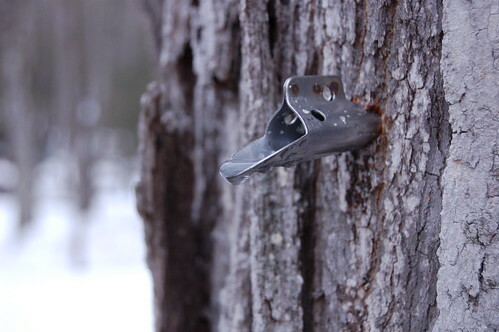 Lately, we've been having cold (below freezing) nights and warm (above freezing) days -- the exact conditions needed for maple sugaring. 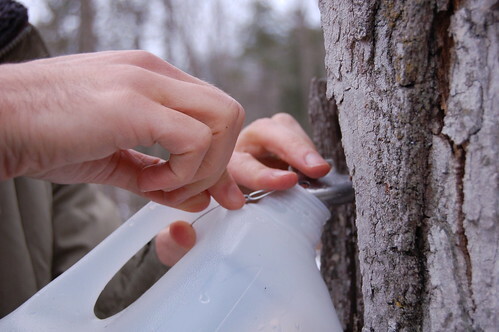 The change in temperature is what makes the sap rise and spill out of taps into waiting buckets. Now that we're back on the east coast, it's finally time come to make this dream come true. I'm happy to report that, unlike so many childhood wonders, the magic of this one has not dimmed with time. If anything, the whole thing seems even MORE magical now that I've finally experienced it first-hand. Two weeks ago, using a drill and a handful of metal stiles from the Accord hardware store, my husband tapped eight maple trees at my in-laws' house. The sap has been gushing forth ever since. 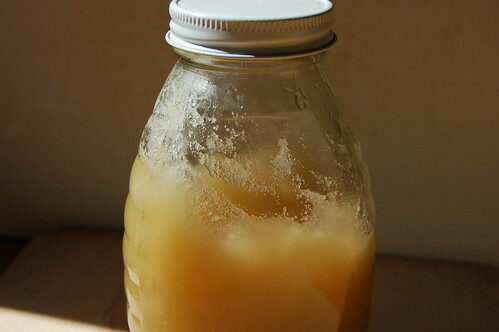 In fact, it came out a LOT faster than we'd expected, leaving us scrambling for bigger containers and rushing to boil down our first batch of maple syrup. 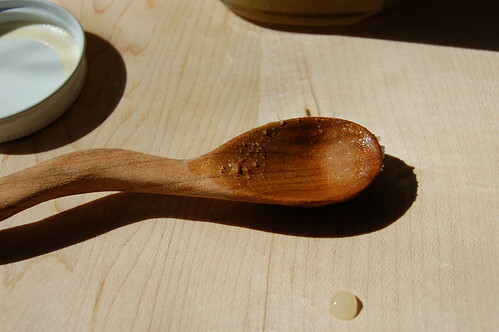 It turns out that sap has a rather short shelf-life, which surprised me. So it's important to gather it often and not leave it sitting around for more than a couple of days, particularly if the temperature is above freezing -- or it will spoil. 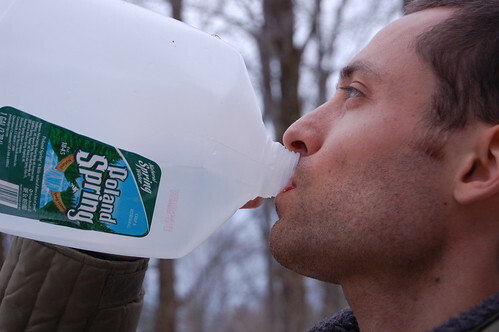 Due to the 40 to 1 ratio that dictates turning maple sap into syrup (that's right, it takes 40 gallons of sap to make 1 gallon of syrup - no wonder the stuff is expensive! ), we knew that five gallons would not yield much syrup but we decided to give it a go anyway. Woefully unprepared, we ended up boiling the sap down over a number of hours, indoors (which is really not recommended, especially if you have wallpaper anywhere in your house! ), in four separate pots. When we were done, the house had been thoroughly humidified and smelled very mapley, indeed. Something went slightly amiss (there's no candy thermometer at our house and we appear to have misinterpreted what "sheeting" looks like) and we ended up making maple sugar instead of maple syrup. I really can't complain about this mistake -- the sugar is rich and startling sweet with a lovely mellow maple flavor and surprising hints of vanilla. I've been putting a couple lumps in my coffee in the morning and sneaking little spoonfuls here and there when I can no longer resist the urge. 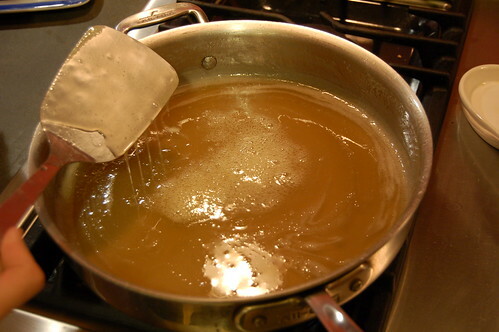 My husband wants to try doing another boil (outside, this time) to see if we can get the timing right to make syrup instead of sugar. I bought a candy thermometer at Woodstock Hardware in preparation and we're gathering firewood and setting up a firepit. The weather is supposed to be gorgeous. Wish us luck! Thanks again to our noble, majestic friends, the maples. Oh, and keep an eye out - a very nice, simple maple pecan scone recipe is coming soon. First of all, I'm ruefully jealous. One of my flavor obsessions is maple syrup. I wish I could experience the tapping and boiling firsthand as you did. What an incredible experience! In fact, one of my most recent posts was Candied Bacon, which uses maple syrup to "candy" the salty bacon. 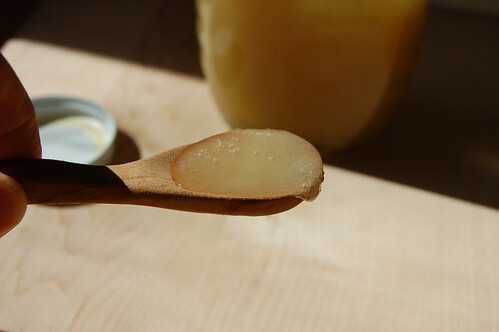 How did you get maple sugar? Was it boiled too long or not enough? It almost looks like crystalized honey! maple and bacon is truly a great combo... we boiled it too long, I believe. That looks like crazy fun (provided one isn't trying to make a living from it). It seems bonkers taht you can just ram a spout into a tree and get the makings of maply syrup. I'm looking forward to reading about your continued experimentation. wow, so jealous! I had friends in Minnesota who did this but never in on the action. can't wait to hear more! I've always had the dream of tapping maples. Sounds like the process was a lot of fun! My first batch was only 2 gallons, so I kept it boiling even longer and we ended up with maple candy. Chewy awesomeness.